Over 35,000 runners signed up to take part in the Edinburgh Marathon Festival this 26th & 27th May. 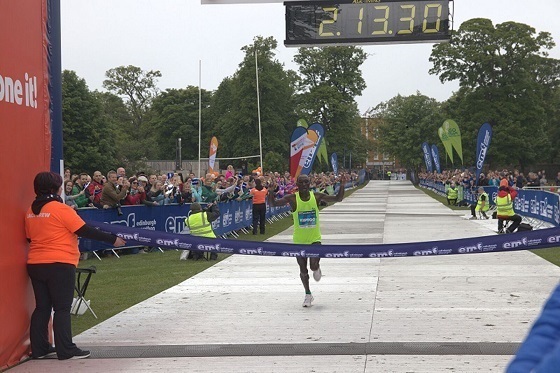 Runners from all over the world gathered for Scotland&apos;s biggest running festival across an action-packed weekend, which included new city centre routes for the half marathon, team relay and full marathon events. Sunny weather made for perfect running conditions on one of the world&apos;s fastest marathon courses, where for the first time in the event&apos;s history, the Edinburgh Marathon Festival worked alongside not-for-profit organisation &apos;Project Africa Athletics&apos; to bring in developing athletes that may not otherwise get the opportunity to take part in a race with the status of the Edinburgh Marathon. Afterwards, Kiptoo said: "It was really nice for me, the course was flat and good. I just ran how I felt as I was alone most of the time. Of course I would love to come back and defend my title next year!" The women&apos;s race was dominated by fellow Project Africa athlete Caroline Jepchirchir, who lead from the front with a time of 2 hours, 47 minutes and 35 seconds. The podium was completed by Edinburgh&apos;s Shona McIntosh in 2 hours, 49 minutes and 7 seconds, and Tracy Millmore from Stanley in 2 hours, 52 minutes and 14 seconds. As if running 26.2 miles wasn&apos;t tough enough, seven runners attempted a &apos;hairy&apos; which involves the grand slam of running a marathon, half marathon, 10k and 5k over the weekend. One of them, Luca Basso from Edinburgh, ran for SAMH in memory of his brother who committed suicide at a young age. Scottish-born Outlander star Sam Heughan completed the marathon as part of a double challenge to raise funds for Cahonas Scotland. Sam said: "My second marathon within a month and another personal best! Thanks so much to the organisers and the volunteers of Edinburgh for making this such a great experience to run. I am so happy to be able to raise awareness for 'Cahonas Scotland' through 'My Peak Challenge', my charity fundraising company. Through donations and a limited edition t-shirt for sale we have already raised over £70K and hope to reach £100K for the fight against testicular cancer." He said "You never know when yourself or somebody close to you might need the same support, so it would be great to help Macmillan keep their services going in any way possible." It was a Spanish one-two at Sunday morning&apos;s half marathon as Severino Felipe Gomez stormed to victory with a winning time of 1 hour 10 minutes and 37 seconds. Fellow Spaniard Arturo Quijada Gonzalez took second place with a time of 1 hour 10 minutes and 53 seconds, and Conrad Franks finished in third with a time of 1 hour 10 minutes and 55 seconds. 42 year old Severino said: "It was a good race, beautiful city! It&apos;s very fast although a little windy today. The people and the city are wonderful, I think it&apos;s one of the best races in Europe." Irish Olympian Breege Connolly was the winner in the women&apos;s race with a time of 1 hour 16 minutes and 9 seconds. The 40 year old said: "I really enjoyed the race. It was definitely tough going in parts with the head wind along the coast but all in all I&apos;m happy to come away with a personal best. The support along the route was great!" She was followed by Glenfarg&apos;s Annabel Simpson in 1 hour 16 minutes and 31 seconds, with Dunblane&apos;s Fanni Gyurko finishing in third place with a time of 1 hour 18 minutes and 32 seconds. "My vision never fully returned, and I never know what the future means for me. I don&apos;t know if in a year I will still be able to do the things I love such as skiing or going hill walking, the things that most, including myself, take for granted. I have learnt now that life can be unfair, but don't let it consume you. As this is the year I turn 21, I want to make sure that from now on I do everything I want to do, in case how my life unfolds in the future will not allow me to do those things." Afterwards, Christoforou said: "I had a lot of fun today. I just wanted to run hard and see what I could do so I&apos;m pretty happy with the time and the win. I train in Holyrood Park a lot so I knew it would be a challenging course. That hill never gets easier but it's definitely worth the graft for the views at the top! The support was awesome the whole way round and that really pushed me on when it started to hurt." The women&apos;s winner was 32 year old Hana Randakova from the Czech Republic with a winning time of 38 minutes and 49 seconds. She said: "I really enjoyed the race - I loved the stunning views and people around the track cheering me on. One guy joined me on the 7km and really helped me to get to the finish. I found EMF while planning a holiday to Scotland with my mum - we always wanted to visit Scotland and I decided to connect the trip with a nice race as I really love running." Marc Quipp, 18 years of age, took part in the EMF 10K for Teenage Cancer Trust. In January of this year he was told he had a cancer that was a Ewing&apos;s like sarcoma. Marc says the first and only symptom was a lump at the side of his hip which he first noticed in September 2017. The lump grew from the size of a pea to the size of a tennis ball. Tests followed including a biopsy, before the diagnosis that it was a cancerous tumour. Mark is currently receiving treatment at the Teenage Cancer Trust unit in Western General Hospital, Edinburgh, and has recently completed his sixth session of chemotherapy. He is due to have surgery to the tumour in two weeks which has been reduced in size thanks to the chemotherapy. Mark said "The care I receive in the teenage cancer unit is second-to-none. From the small things such as no restrictions on visiting hours, to the more luxury matters of my own en-suite and Sky Sports in the room, I can assure you that the work and facilities put in place by the Teenage Cancer trust most definitely makes something so horrid, all the more endurable." Amy said "I really enjoyed the 5km today, it&apos;s a great route with awesome support throughout and amazing views as you head up and around the park. I&apos;m so happy to have won the women&apos;s race amongst some tough competition and I'm looking forward to running in the half marathon race tomorrow morning." Ashley Macrae took part in the EMF 5K to raise funds for the Stroke Association after she suffered a stroke last year at the age of 22. She was on holiday in Thailand when, whilst travelling on a bus, her friends noticed her speech was slurred and she couldn&apos;t use the whole left side of her body. They got her to a medical centre so quickly. "As soon as I got to hospital they took me for an MRI scan. They said there had been a bleed in the brain and that I&apos;d had a stroke. I couldn&apos;t believe it." Around 1600 youngsters took part in Saturday&apos;s junior races, consisting of the 1.5k for 6-8 year olds and the 2k for 9-12 year olds, as well as both the Junior 5K and the Kids&apos; Kilometre. Neil Kilgour, Edinburgh Marathon Festival Director, said: "2018 has been another incredible year for Edinburgh Marathon Festival with outstanding performances, tens of thousands of participants and millions raised for good causes. "We are so proud to host a truly world class running event in Scotland&apos;s capital for runners of all ages from across the globe. Congratulations to everyone who took part. Thanks for making the 2018 Edinburgh Marathon Festival one of the UK&apos;s greatest mass participation events. Come and see us again next year!" Entries for the 2019 Edinburgh Marathon Festival which takes place on Bank Holiday Weekend on Saturday 25th and Sunday 26th May 2019 are open with an early bird discount for everyone who registers before midnight on Sunday 10th June at www.edinburghmarathon.com.